In 12 short thematic essays and an interview, all previously published, the hyper-prolific author of novels (Blonde), story collections (Faithless), plays (In Darkest America) and poems (Tenderness) examines the writing life, aiming to focus on""the process of writing more than the uneasy, uncertain position of being a writer."" Oates advises young writers to read widely, takes a nostalgic glance back at childhood influences, waxes poetic on the joys of running and its relation to writing, and tackles the inner trajectories of the creative process. 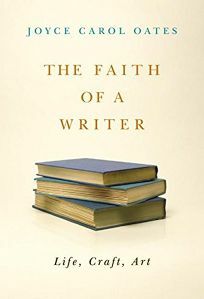 The essays are peppered with anecdotes concerning writers' trials, doubts and influences; these well-selected snippets form the most enjoyable and illuminating aspect of the book. If Oates's own insights don't always live up to the wit and beauty of such quoted authors as T.S. Eliot and D. H. Lawrence, it may be because she gives herself comparatively little room to wrestle with such broad concepts as inspiration and failure. Oates's suggestion that writers as a breed apart may irritate the""ordinary reader"" she refers to (whom, she suggests, might not know that""no story writes itself"") and may even make writers uncomfortable (to write, she says, is to""invite angry censure from those who don't write, or who don't write in quite the way you do....Art by its nature is a transgressive act, and artists must accept being punished for it""). But Oates obviously understands the faith that writing, that""juncture of private vision and the wish to create a communal, public vision"" takes, and young writers especially may find words of wisdom here.